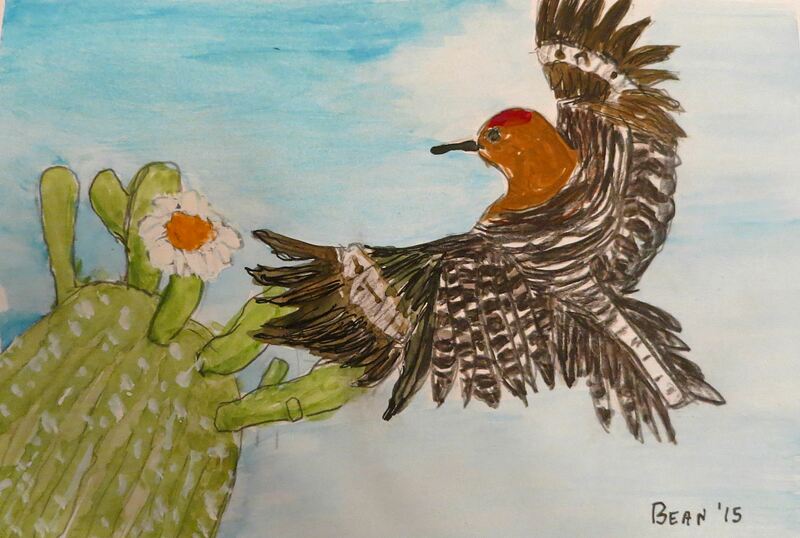 This was a carefully drawn, then painted, illustration of a gila woodpecker I did to go with an Audubon birding blog. 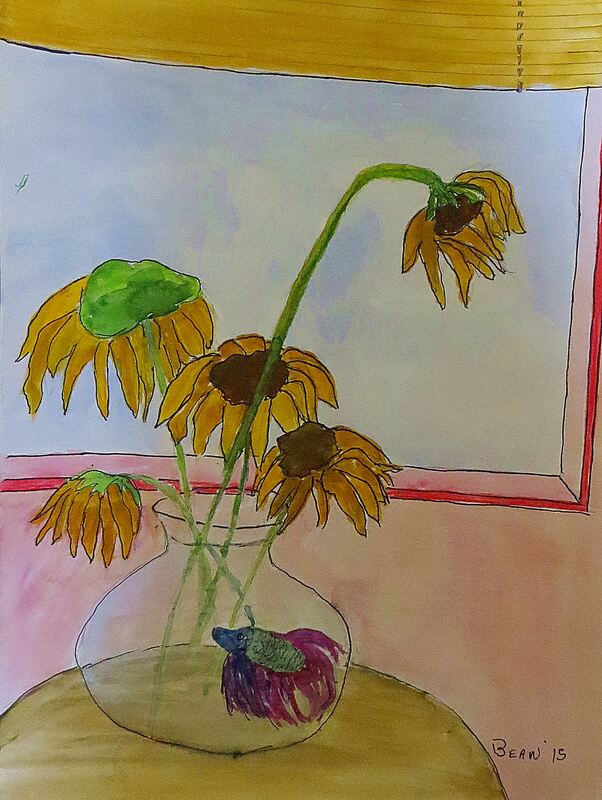 This was a freehand watercolor I did quickly, spending maybe 15 minutes on, and with no advance drawing. I love it. When I was a reporter, I learned to talk to everyone from the homeless guy on Ogden, Utah’s 25th Street to Congressman Jim Hansen in his Washington D.C. office. I loved my life because it was always different and never boring. And this is a piece I agonized over for days because I had a bright idea of a fish in a bowl of flowers, and which in my opinion is a total flop. I hate it. But I eventually developed a voice as a journalist, not so much my own voice but as a style of writing in which I let readers see the world through my eyes. It was more difficult after I retired and began writing personal essays. I had to work to develop my own voice, and that took time. I finally decided that I write with an old broad’s voice, and I say that proudly, who is a wandering wonderer. 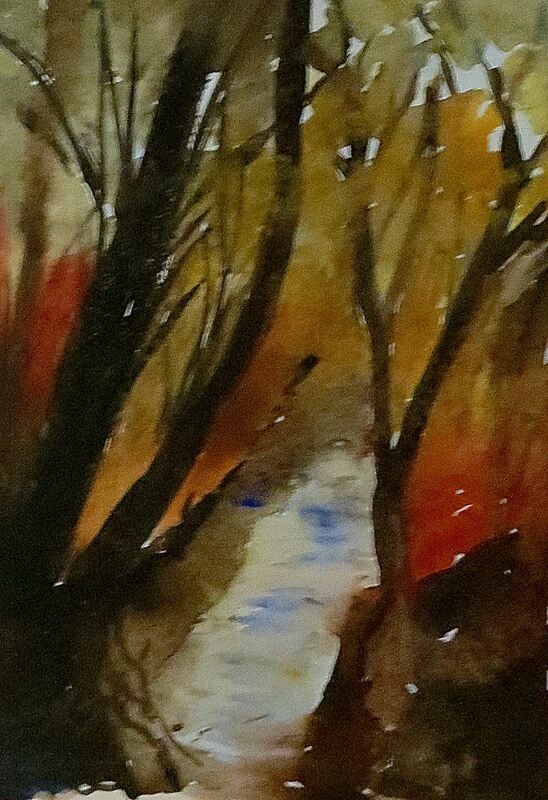 Lately I’ve become more active in art, particularly watercolors. This morning I looked at three recent pieces and realized, as far as technique and style, they had absolutely nothing in common. I keep experimenting hoping that I will discover an artistic voice, just as I have a writing voice. Right now my artistic efforts are clearly schizophrenic. But then again maybe that’s my real art voice. What do you think? Bean Pat: Paths of Color http://tinyurl.com/pyosgg3 Now this is an artist with a distinctive voice, and its one I love. I really like that freehand watercolour. Ah, my dear Pat, there is absolutely nothing schizophrenic about your artistic efforts! This is how us artists work! We discover things each time we create. It’s a journey to the unknown! Beautiful work, my dear and I find your ‘voice’ wonderful! Your kind words touched me. I don’t consider myself an artist, a statement that just last month I was criticized for making by my sketching group. It’s an echo of a criticism I’ve given to many writers for years who say they’re not real writers, and years after I finally accepted that I was a writer. Your comment is a confirmation that I shouldn’t make that statement about not being an artist again, even if its schizophrenic art. Thanks for brightening my morning Marina. I do truly love your art. .